Hawaiian stories are only a click away! Heitiare (Kawehi Wallace) Klammerer (Seabury '03), speaks about E Pa'a Pono, the book she wrote in Hawaiian. The book is available at ulukau.org and can be read either online or downloaded. "The book was part of several other books that I took part in. E Pa'a Pono In particular is one that I authored, designed the layout and did the photography. The book project was a partnership with several community groups in the Ko'olauloa area headed by the Na Kamalei-K.E.E.P. 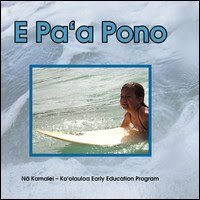 Early Childhood Education Progam of Punalu'u. The project was to tell stories related to the Ko'olauloa area of O'ahu. The story E Pa'a Pono comes from the Kula Kaiapuni 'o Hau'ula. Having been a teacher at Hau'ula Elementary, I was given an opportunity to put in a story idea for our Hawaiian Language Immersion Program (HLIP). I put in a story idea that showcased the Hawaiian language and its importance. The story also highlighted the local Halau Nalu or Surf Club which is made up of most of our keiki from HLIP. The Halau Nalu is just a great outlet for Hawaiian keikis as well as non-Hawaiian kids to learn the Hawaiian sport of surfing as well as practice language and culture. Mainly the book is meant to show the importance of preserving our Hawaiian language. I believe it is the kuleana of all who love Hawai'i and who make Hawai'i their home. I don't know how it is that people separate language from culture because they go hand in hand. As the 'olelo no'eau or Hawaiian proverb explains it best, "Ma ka 'olelo ke ola, ma ka 'olelo ka make". In language there is life and death. E ola mau ka 'olelo Hawai'i." Mahalo, Kawehi, for sharing your mana'o with us and for helping to preserve our Hawaiian language!